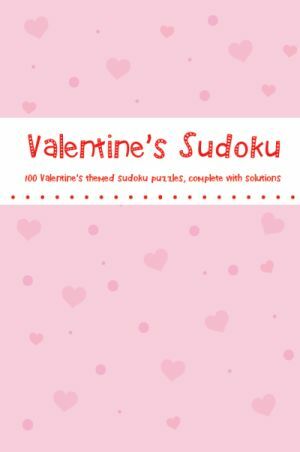 Valentine's Sudoku is packed with 100 challenging sudoku puzzles! Great for the novice or experienced puzzler, these puzzles get gradually harder as you go through the book. 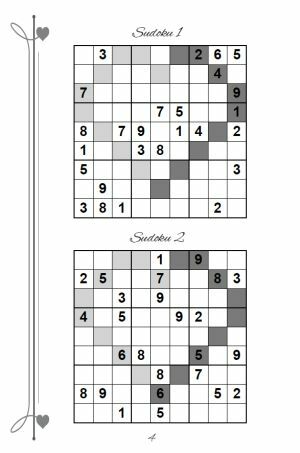 The rules for Valentines sudoku are as normal for a standard 9x9 grid, except the two grey regions forming a heart shape both need to contain numbers from 1-9. This fun little sudoku variation will make a truly special gift for your loved one on Valentines day! Remember that the two grey regions that form the heart are not there for decoration, they are an integral part of the puzzle. The key to solving the puzzles will be the extra information that they provide. This will also be the hardest part, as the regions will be unfamiliar. If you've been brought this book as a gift, then perhaps your loving partner would like to make you a nice tea or coffee whilst you solve and feed you chocolates, just to help you concentrate on solving the puzzle of course!